The Dodge Grand Caravan has been Chrysler’s family road warrior for generations, ever since it was introduced in 1983 as, simply, the Caravan. The most flexible minivan on the market today, it’s also a nine-year-old offering that doesn’t keep pace with the latest crash-test scores, while it easily outpoints its rivals with a superior seating system and matches them for features that make long-distance trips go smoothly. It remains one of the best choices for carrying up to eight passengers–and for keeping them entertained along the way. The Grand Caravan competes with the well-mannered Honda Odyssey and the big, all-weather-capable Toyota Sienna. There are other competitors–Nissan’s Quest and the recently returned Kia Sedona–although none of them pack the value found in the Dodge. The Grand Caravan stays true to the boxy styling theme that it’s worn for most of its life, save for the 1996-2007 model years. We liked those egg-shaped vans, but the functional, space-efficient outline of today’s minivan pays dividends in its light, airy interior. It’s slab-sided and relatively plain compared to the lightning-bolted Odyssey and the low-nosed Sienna, but the Grand Caravan emphasizes glass over sheetmetal, affording very good outward visibility. The interior’s now up to grade, too–in 2011, Dodge replaced the plasticky cabin trim from the 2008-2010 model years with much more appealing textures, giving it a real impression of quality. A single drivetrain configuration puts all Grand Caravans on an even playing field. The engine’s a 3.6-liter V-6, with a class-leading 283 horsepower, coupled to a six-speed automatic transmission, with power shipped to the front wheels only–all-wheel drive left the lineup after the 2007 model year to make way for Stow ‘N Go. Smoother here than in most other Chrysler vehicles, the powertrain has just a touch of the V-6 groans, and an abundance of strong low- and mid-range power. Steering and ride are not quite at the level of the Honda and the leaner Nissan Quest, but the Grand Caravan feels composed enough at speed. Our main gripe is that the Dodge bounds over any series of small bumps; the damping really should and could be better. Minivans are all about utility, and carrying the maximum cargo and number of people, which makes Chrysler’s fold-away second- and third-row seats a brilliant idea. The Stow ‘N Go seating system is standard on all but the base trim, where it’s available as an option. The seats fold flat into spaces in the floor, and when they’re in use their homes double as storage bins. To accommodate the disappearing act, the Chrysler seats are thinner and flatter–but we’ve never heard a kid complain about the seat comfort, and it’s tough to beat the flat load floor created when all of the chairs disappear. We’ve taken our turn in the Stow ‘N Go seats without complaint. The Nissan Quest used to have a similar arrangement, but it abandoned the setup for a fold-away third-row seat and fixed second-row seats; the Odyssey and Sienna have sliding, fold-down second-row seats and fold-away third row seats. The Grand Caravan’s third-row seat has a power-fold option, too, as do its side doors and tailgate, and converting the space to pure cargo hold takes just seconds, thanks to improvements made recently. 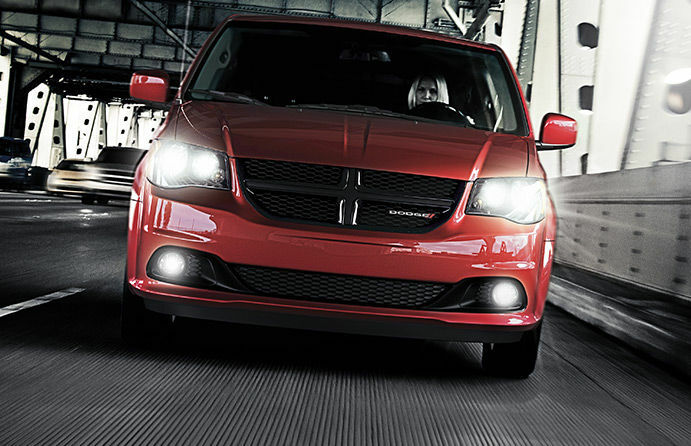 Safety is paramount in family vehicles, and the Grand Caravan has seen its safety ratings dim over time. It gets a four-star rating from the NHTSA, but the IIHS gives it a “poor” rating in its tough new small-overlap crash test. Each Grand Caravan comes with curtain airbags and stability control. A rearview camera, Bluetooth, and blind-spot monitors are available, and the power sliding doors have gentle closure that rebounds if obstruction is detected. A base Grand Caravan now costs about $20,000, an incredible bargain for the class–even when compared to economy cars, it’s a strong value. For a well-equipped version with satellite radio and other luxuries, the price is still less than $30,000. If you choose, the Grand Caravan can be ushered into the pricing stratosphere with a cavalcade of electronic goodies that’s second only to those in the Ford Flex. Top models can be equipped with a media hard drive, navigation, satellite radio, and Bluetooth—even a Blu-Ray DVD entertainment system with USB ports for charging, or on-board data service via Chrysler’s UConnect Web. Changes are few for 2016, as Chrysler is preparing a new generation of minivans for sale sometime in 2016.